No Power To Your Boiler? Here’s What You Need To Do Next. Got no power to your boiler, timer, or thermostat? No problem. If your boiler won’t turn on, we can help. This 5-minute guide will help to determine what the problem is, so you can get your boiler working again. No power, and no patience for your rotten old boiler? You can get a fixed price online (no personal details needed) from BOXT. Being part owned by Bosch, they offer awesome deals on Worcester Bosch boiler installations. 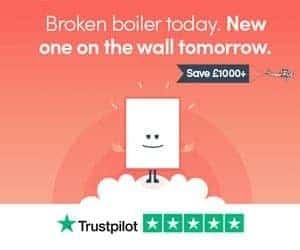 You can use their boiler price calculator to get your fixed price in less than 90 seconds. To stop damaging electrical components in your boiler, manufacturers fit them with a fuse. If there’s a surge of power, the fuse has likely blown, and this will cause your boiler to have no power. Your boiler won’t turn on without a functioning fuse. Change the fuse, and you should get power back to your boiler. Head over to your RCB (fuse box) and check to see all switches are in the same position. It’s likely that the RCD has tripped. Sometimes, this will be the whole property. But, a lot of properties are “zoned”, meaning sections of the house are on different circuits. There’s a good chance that the section of your house the boiler is in, has tripped. It’s particularly common for an RCD to trip (meaning no power to a boiler) after a power cut, or in extremely bad weather. Are you on a pay-as-you-go electric meter? Do you have credit? If you do, there’s a chance there’s a fault with the meter. As most electric meters are now digital, utility companies can resolve issues over the phone. Getting no power to your boiler or timer? If you’ve tried everything listed above, the PCB on your boiler could have failed; it’s a common boiler problem. The PCB communicates with other parts of your boiler (pump, valves, thermostat, timer etc) to keep your boiler operational. A boiler engineer will be able to run a basic electrical test to see if the whole boiler has no power, or the fault is limited to the PCB. Luckily, not all faults relating to a boiler with no power are fatal. Sometimes, it looks like a boiler has no power, but it’s a simple LED failure. It’s a small probability, but there’s a chance the power light on your boiler has broken. Again, a simple electrical test can determine what the problem is. Most big electrical appliances will be segregated from an electrical circuit (a cooker for instance) by a fused spur. A fused spur is a socket with a little red window in it. If your boiler is plugged into a spur and has no power, this could be the problem. A boiler won’t turn on without an active fuse in the spur. Before spending big cash on fixing a boiler, check the fuse in the spur isn’t blown. After the problem causing the boiler’s power problem has been fixed, you’ll need to reset your boiler. New boilers will have a reset button on the display board; this is located on the front of the boiler. If your boiler doesn’t have a reset button visible, check your owner’s manual. Many older boilers have a reset procedure that’s not as simple as just pressing a button. Still got problems with your boiler? Get a fixed price on a new Worcester Bosch boiler here. Or, head over to our boiler problems article to investigate your problem further. If you have any questions, leave a comment below and we’ll reply as soon as we can.